A kid supported FC Barcelona. His friends asked him, Messi, Iniesta or Xavi? Sergio Busquets replied the innocent mind. Just like his idol, his opinion was disregarded. The short two lines above are just an imaginary scribble. But a person who understands football and values the presence of Sergio Busquets in a team would understand the depth of the lines. Ask any expert to name their top 10 midfielders. Ask any kid who his favorite midfielders are. Some names will make every list. Paul Scholes, Andres Iniesta, Xavi Hernandez, Ryan Giggs, Steven Gerrard, Zinedine Zidane and so on. Ask any Barcelona fan about his or her favorite players. Ask a Real Madrid fan who they would like on their side or who do they prefer not to face. Lionel Messi, Andres Iniesta, Xavi Hernandez, Carles Puyol, Philippe Coutinho will surely be there. If Johan Cruyff has such glowing respect for the Barcelona midfielder, it is baffling why plenty of common football fans do not get the same idea. Cruyff has been one of the finest footballing brains in the history of the sport. Today, such incredible insight into the "beautiful game" is lacking. N'Golo Kanté is seen as the best defensive midfielder in people’s eyes, often without second thought. But what happens if Kante is taken out of Chelsea. Is there any difference? Chelsea is not affected much. Take Kante out of France, they are still the same world cup winning team. The Spanish team had Busquets at its heart. Spain’s World Cup campaign is owed to Iniesta and Xavi. Yet the man in the hole between them, who was a prime reason for the defensive solidity of Spain was as important. He put the finest balls to create something with, for Xavi and Iniesta. He was the pivot of the Spanish team. But Sergio Busquets is unlike him. When he gets a match suspension, just notice the Barcelona defense. A perfect paradigm of a Busquet-less Barca defense is the Champions League quarter-final (2017) against Juventus. The defense did not hold shape without him, it got terribly out of position. The positioning to anticipate the ball was weak, no player tried to pinch the ball. If Busquets would be there, he would provide cover to the defense, the ball is pinched by his tentacles, and he has a read of every move. Lionel is the best player in attack for Barca but his masterclass is often canceled out by a weak defense. Simply put, Busquets is as valuable as Lionel Messi. Busquets is a complex player who possesses simple skills. He can measure the power required for a pass in his mind. His passes are well placed and precisely powered. He can keep the ball away from the opposition for as long as he wants. Busquets turns with sleek adjustments moving away from the players and perfectly in position for the forward pass. If you are troubled, just play Busquets in, he can pick any pass from any distance. He can turn an interception into a quick counter in a matter of seconds. He walks here and there and instantly decides what position he wants to be in, and mysteriously the ball comes there. These skills sound simple but are the toughest. Playing simple doesn’t mean playing in a limited fashion. Busquets makes a play look easy but he doesn’t get credit for the team performances. Busquets and salt are simple things. Their presence is not noticed but the absence is felt. Football was always meant to be Busquets’ life. His brother played the game and his father was a backup player in FC Barcelona. Busquets’ dad Carles had to leave Barca due to impatience of Louis Van Gaal but he wanted to make sure his son plays for Barca. Busquets played for youth teams at Badia and Lleid before being picked up by Barcelona scouts and he made the move to La Masia. Busquets was playing in the third division under Pep Guardiola. Guardiola began coaching Barca after Rijkaard left and he picked up Busquets from the B team and promoted him to the first team. Sergio has been at the heart of Barcelona defense since then. Carles Puyol was always the on the field defensive general as long as he was playing but after Puyol left Busquets took on the number five jersey on personal request from Puyol himself. Sergio thus inherited defensive captaincy from Puyol and has been an immovable piece of the jigsaw puzzle at Barcelona. He fits in seamlessly into any midfield. That is how well he blends in. 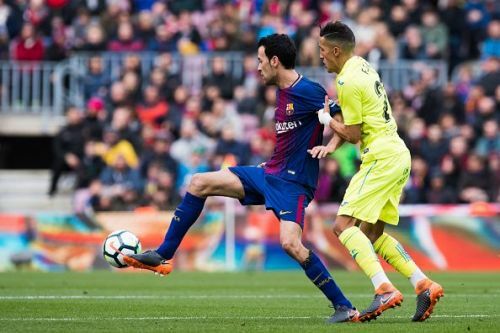 If you want to stop counters, tell Busi, he will slip his tentacles into the fast moving forward and pinch the ball. The nickname as Octopus is earned due to his precision intercepting ability. Just look at last season’s El Clasico (2017-18 season) at Bernabeu, Busquets was just trying to fend off an attacker and he turned away to see an open field. Without second thoughts he played Rakitic in, enabling him to run into the full open space. Within 30 seconds of the pass, Barca led the Clasico. While credit may be given to Rakitic who ran box to box or Suarez who ultimately scored but the game reading of Sergio was the biggest factor there. If anyone has to name individual brilliance last season, they would pick out Messi against Chelsea, Ronaldo against Spain, and Modric against Argentina. But with due respect, among all those performances, Busquets’ immeasurable genius against Chelsea is also a standout. Busquets was simply magnificent on the pitch, having the most touches, most passes and six tackles to his name, while Kante in stark contrast against the not-so-normal self of Barcelona attack managed only 4 tackles and 25 passes. Busquets is also misinterpreted as a diver. His only mistake in his whole career, his one dive against Inter Milan is the only basis for his judgment and gave him such a reputation. Even though other players, do it time and again Busquets is the one who is often attributed with playacting. As misunderstood as he is, it has no impact whatsoever on his greatness. Busquets is also not recognized because he is not the part of the highlight reel. Vicente Del Bosque's tribute, however, sums it all up- “You watch the whole game, you don’t see Sergio Busquets. You watch Sergio Busquets, you see the whole game.” And truly it is as if, Busquets is a tad higher than the rest of players, he could see up the pitch in a nanosecond. Sergio Busquets is no doubt the best defensive midfielder in the league. His comparisons to Kante could be Kante’s biggest achievements in his career. Casemiro might be labeled as the best by Madrid fans but Casemiro himself said this about the Catalan midfield general. A bit of happiness is felt when Busquets gets the recognition that he so well deserves. He is Barcelona’s best defensive contributor and one of the best players to don the Barca colors. The Octopus of Badia. Sergio Busquets is still the most underrated midfielder in the world, sadly. Celebrating Busquets’ 10th anniversary with Barcelona. Thanks for the sweet turns Busi and thank you Pep for bringing in a third division player into your team and rest, as they say, is history.